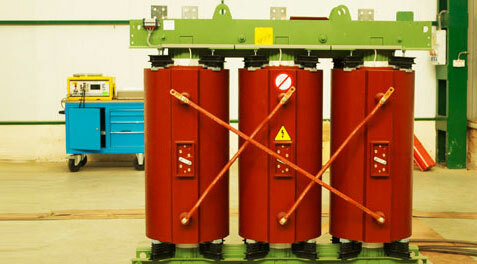 Cast Resin Transformers | Power & Distribution Transformers | Imefy, S.l. Thermal class F: manufactured with materials which are suitable to work at a maximum temperature of 155 º C.
Thermal class H: manufactured with materials which are suitable to work at a maximum temperature of 180 º C.
Environmental class E2: transformers ready to work in humidity environmental conditions up to 90 (± 5%) and water conductivity of 0,5 S/M to 1,5 S/m. Environmental class E3: transformers ready to work in humidity environmental conditions up to 95 % and water conductivity of 3,6 S/M to 4 S/m. Fire behaviour class F1: Self-extinguishable transformers in a short period of time starting from the disconnection of the transformer and without production of opaque smokes and halogen-free. Power ratings: From 50 KVA up to 20 MVA. Insulation level: From 1,1 KV up to 36 KV (we can manufacture up to 52 KV on customer requirement). Voltage regulation in any of its windings by means of screw bridges up to 7 positions. Vector group: monophasic or triphasic transformers with possibility of triangle, zig-zag or delta connections in any of its windings. Number of windings: Possibility to manufacture transformers with primary + secondary, double secondary, triple secondary and any other type according to requirements of customer. 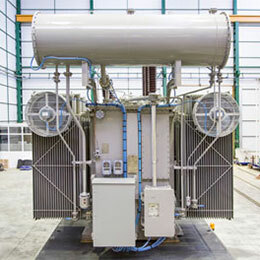 Cooling: transformers are manufactured with the following type of cooling according to UNE-EN/IEC 60076: AN and AF. Losses Level: possibility to manufacture lower losses than those of the standards in force, according to requirements of customer. Core: two or three columns, cut and assembled with any of the qualities of magnetic steel available in the market. Windings: They are manufactured with any type of conductors, aluminum or copper. Iron works: Possibility to supply metallic enclosure up to a protection degree IP-34, with a standard coating C2-M. 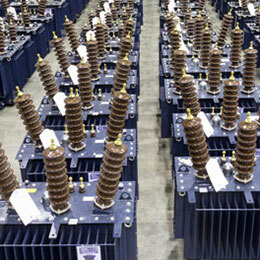 Possibility to supply transformers with plug-in bushings. Temperature sensors inside windings, type PT-100.